Of course, it’s not strange or any surprise with 500 likes on facebook since most of the general blog or people could win thousands of likes. Osify does not do any promotion, nor link or share. I am happy enough to share from my own way. In fact, I have separated my posts into different sub sites and some people haven’t been aware about this. 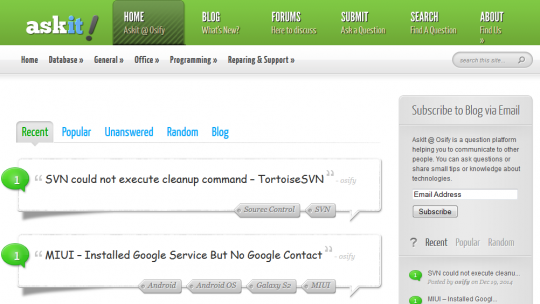 I write about some technical tips or solution on a site, AskIt @ Osify, which has already around 70 issues and solutions. General news about tech in Cambodia, News @ Osify, has around 60 posts already. And this main blog will be time by time, it’s about products display, my own research articles or idea and some feature stuffs. New design will be raised as well soon. Overall statistic through Google Analytic, we received around 400 daily visitors. That’s not bad. Of course, 2015 is coming, I do hope thing is better. I will be later talking about the plan.